120Â° FOV 1080P FHD Camera: Upgraded wide-angle 1080P lenses with 120Â° FOV, can easily adjust for 90Â° by remote controller when flying, and capture every aerial moment or smooth live video with crystal clear image at the same time. Optimized 5G FPV Wi-Fi Transmission: With built-in dual scientifically arranged transmitting antennas, 5G FPV(first person view) Wi-Fi Transmission will help you to see live video of the beautiful world in a special way(from birds-eye perspective). You can also one-click to share the clear and smooth live video(with sound) with your friends via Facebook, Snapchat, Instagram, WhatsApp,WeChat,etc. even your drone is 984ft(300m) away. GPS & GLONASS Dual Positioning: Accurate GPS and GLONASS dual positioning system with less than 1m relative location error. Auto Return(RTH) function prevents the drone from losing, the drone will fly back to home points (take-off point) when press the return button, ideal operation for one key take-off or landing. It is also capable of 360Â° rolling and flight points planning(max 16 points) , which has added so much fun to flying. 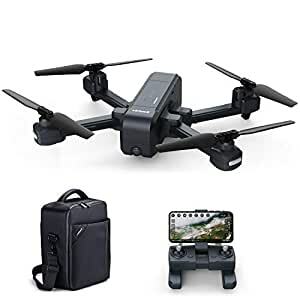 Newest Follow Me & Gesture Photo Taking: Follow Me mode makes the drone always follow you to catch your every movement, like take aerial photos, shooting live video, etc. GPS active track and Gesture Photo Taking modes allow the drone achieves hands-free shooting totally, perfect for selfie. 4. Press take-off/landing, propellers start spinning and the drone take-off at an altitude of about 5 feet, you may control the drone by your transmitter now.